There has been some major changes recently in regards to just where casino and poker players based in New Jersey can sit down and play their preferred gambling games, for not only are these players now able to play in any of the many land based casinos located throughout the US State of New Jersey but they can now play at a range of online poker sites and casino sites. However there are still certain gambling sites that have not been given the green light by the Gambling Commission in regards to residents based in New Jersey being able to gamble at those online gaming sites and one category of gambling sites that is at this moment in time not legal to gamble at is online sports betting sites! This may seem rather strange, for as you can now perfectly legally and at any time of the day or night log onto any approved casino or poker site and play any games that take your eye perfectly legally for real money, why can a sports bettor not do the same? 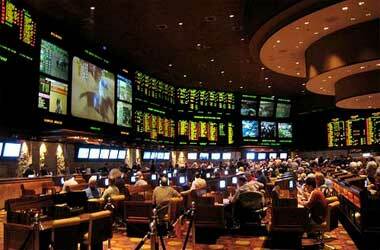 It is down to the fact that the actual sport betting industry is not as easy to licensed and regulate as the online poker and online casino industry in as much as one of these two newly licensed gambling environments have their servers and entire online operation located within the New Jersey State boundaries, and a sporting event on the other hand could be taking place in any part of the world. Racing tracks in particular do have their own online gambling sites in place and may not be prepared to allow other US States to license and regulated betting sites that can take bets and wagers on the horse racing they have on offer at their venues. However, we are expecting that in the coming months if not in the next year or two the whole online sports betting environment is going to be going through something of a makeover, and we will expect several US States to offer online sports betting to their residents. There are some legal hurdles that do of course need to be looked at and changed, for the wire act does not permit people to place a wager on sports betting activities by telephone wire, and this is causing major confusion in regards to online betting and all internet traffic could at some point or another in its transmission be deemed as using a telephone wire! If you are currently in the US State of New Jersey and you wish to place a sports bet online then please do not be tempted to use any of the off shore sports betting sites for these sites have no real licensing and regulatory structure in place and as such you will be breaking the laws gambling at such sites and will run the very real risk of placing a ager at a sports book that will have no legal requirement to pay you out if you win! By sending money offshore you never know to whom you are paying those funds to and as such you should avoid betting online until such a time that New Jersey issued online sports betting licensed and can fully regulate these venues located within their jurisdiction.